YANGON, Myanmar (CNN) -- Final arguments in the subversion trial of Myanmar opposition leader Aung San Suu Kyi unfolded Monday. Lawyers for the American man who allegedly swam to Suu Kyi's house are expected to present closing arguments, as is the defense team representing Suu Kyi's two housekeepers. Suu Kyi's lawyers presented their concluding remarks Friday. Soon, prosecutors will offer their final say -- also expected Monday. It was not immediately known when a verdict was expected. A diplomatic source said a recess will likely follow, and a verdict could come one to two weeks after that. As usual, security in and around the courtroom at the Insean prison compound near Yangon was tight. Trucks full of police officers idled outside as proceedings got under way Monday. Suu Kyi and her housekeepers are being tried on charges that stem from a May 3 incident. That day, an American, John William Yettaw, allegedly swam across a lake to her crumbling, colonial-era home and stayed for two days. The government said Yettaw's presence in the closely guarded home violated Suu Kyi's house arrest. The country's regime rarely allows Suu Kyi any visitors, and foreigners are not allowed overnight stays in local households without government permission. 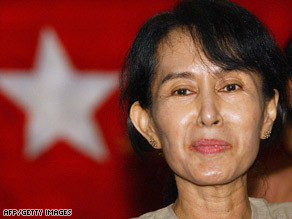 Suu Kyi said she doesn't know Yettaw and didn't know of his plans, and denies any wrongdoing. She is charged with subversion. If convicted, she faces up to five years in prison. Yettaw, a 53-year-old former military serviceman from Falcon, Missouri, testified repeatedly that God had sent him to Myanmar to protect Suu Kyi because he dreamed that a terrorist group would assassinate her. He is charged with violating immigration laws and trespassing. The charges carry a maximum sentence of five years in prison.